Evan’s son, Charles Peyton, had a wife, Elizabeth, whom you also stated was a Carter. That does not appear to be correct. Everything points to Elizabeth being the daughter of Thomas and Priscilla Roberson. You stated that, per the Revolutionary Pension records of Charles Peyton, that his heirs were the children of James Peyton. Please recheck your records on that, as the heirs of Charles were his own children (Thomas, Valentine, and Nancy/Ann), not the children of his brother, James. The letter of Nancy “Payton” Limbrick, daughter of Charles Peyton, is in his pension file and clearly shows that she is his daughter, not niece. If Charles Peyton’s heirs were the children of his brother, James, he would not have been the father of the children you have listed for him, and we know that he actually was their father. Nancy Payton Limbrick and her husband were murdered by her cousin, John T. Roberson, per the newspaper account. John T. Roberson was not the son of George Roberson and Anne Peyton, as you have stated, but was the proven son of John Roberson (and Maria Rogers), son of George Roberson and Fenton Jett. George Roberson was the son of Thomas and Priscilla Roberson. John T. Roberson was a cousin to Nancy Payton Limbrick because his grandfather was a brother of Charles Peyton’s wife, Elizabeth Roberson. 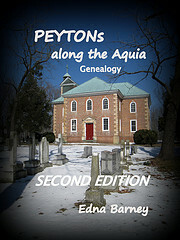 Anne Peyton, whom you have stated was the wife of George Roberson, was actually the old maiden sister of George Roberson. Anne Roberson died in 1813, per the White Oak Primitive Baptist Church Records, and a story has been passed down regarding her death. Bill – I cannot say whether Elizabeth is a CARTER or a ROBINSON, as I have no sources for that. The same goes for the entire ROBINSON family lineage . Discovering that the Revolutionary War Pension that I was using for Charles really belongs to another Charles, turns this entire line on its head. I could not find a pension record for the Charles PEYTON who married Elizabeth and had a son Valentine. I now doubt that Thomas born 1790 is his son. You see, the Revolutionary War Pension that I was told belonged to him was #8165. Since you say there is another pension for a Charles PEYTON who left children, this one #8165 obviously belongs to a Charles PEYTON of the Falmouth area of Stafford who left no heirs. The three children of his brother James applied for his benefits in his pension record. Their names were Thomas and James PEYTON and Nancy LIMBRICK. On the 1850 census, Gustavus and Ann LIMBRICK live next to Valentine PEYTON and James PEYTON, both seemingly single males. Thomas lives a bit further. These are obviously the children of James PEYTON, deceased. There was another Ann LIMBRICK the exact same age in Stafford, who could have been the “Nancy LIMBRICK” of Charles’ pension, but she does not have the close connection to the PEYTONs as do Gusavus and Ann LIMBRICK. Now the Charles PEYTON, son of Evan, could still be the Revolutionary War pensioner who died with no heirs, as his wife seems to be deceased before he applied for his pension. But what about his supposed son, Valentine? Did Valentine have children? Did he die? And what about the other pension that I cannot find? So that is all I know for now. If you can give me a clue where to find the Revolutionary War Pension that includes letters from Nancy LIMBRICK showing her to be a daughter of Charles, I will certainly check it out. 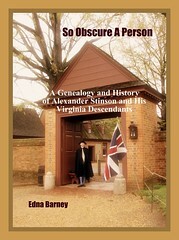 She could be the other “Ann LIMBRICK.” For now, all I know is what the pension record tells me – that James, Thomas and Nancy were children of James PEYTON who was the brother of Charles PEYTON the Revolutionary War soldier of Stafford County.